The 1948 Australian tour has a great significance in cricket history. It was the first side to tour England unbeaten and was Sir Donald Bradman’s final appearance in England and his last Test series. To commemorate that very special year and the remarkable record of the team, we are proud to present ‘The Invincibles’. 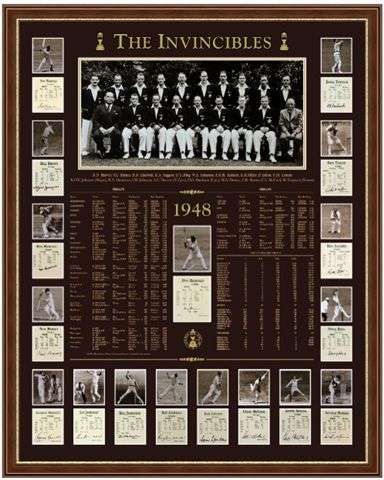 The other 9 players Don Bradman, Lindsay Hassett, Ray Lindwall, Keith Miller, Don Tallon, Sid Barnes, Ian Johnson, Colin McCool, and Ron Saggers signatures are pre-printed. All in all, you would be hard pressed to find this many personal signatures on a product that represents the 48’ team. Finally, the surrounding mat border has printed details of the entire 1948 season with all Match results and First class averages. Never again, will such a release be available to the public.